Latest News : NOBODY LOVES A FREELOADER. JUST BUY A TICKET. NOBODY LOVES A FREELOADER. JUST BUY A TICKET. Love is in the air with G:link this February, not just on Valentine’s Day. 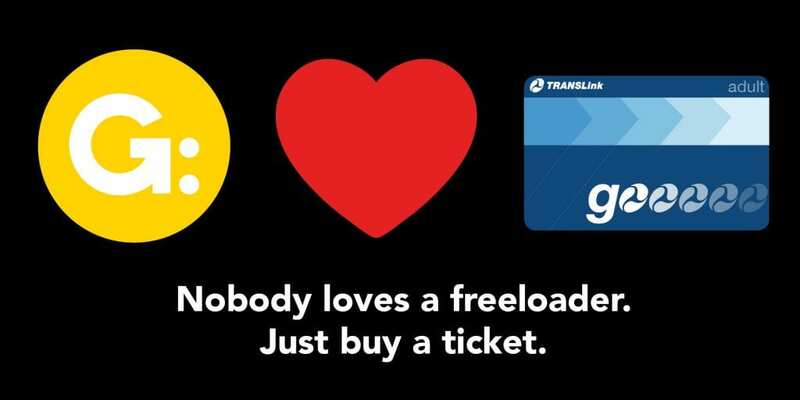 When you and your loved ones are riding the G: keep that warm and fuzzy feeling by always travelling with a valid ticket. Wining and dining your favourite Valentine during February is easy using the G:, with stops near great restaurants, bars or to watch the sun go down over the ocean. Simply plan your journey and make sure you and your loved one have a valid ticket before riding the G:. Having a valid ticket or touching on with your go card will save you and your valentine any embarrassment when asked by a ticket inspector (authorised officer). Authorised officers check tickets frequently on trams so don’t be a freeloader. It’s cheaper to buy a ticket than to pay the fine, plus you’re doing the right thing and protecting our ticketing system. The best way to ride the G: is with your go card. Just touch on before and after each tip and top up at any G:link station. It’s that easy! There back! The couple from our 2017 Valentines Day Freeloader video is back again for 2019! The G: loves go cards, but not freeloaders. Always travel with a valid ticket. For more information about fares, ticketing or to plan your journey, visit TransLink or call 13 12 30 anytime.